DEWY RADIANCE: Nurture your skin with this superior hydrating serum and your skin will respond with an almost instant glow (minus the oily 'shine'). Made for those who are looking to rejuvenate their skin and give it a fresh start! NOT JUST HYDRATION: This professional grade VEGAN hyaluronic acid serum not only moisturizes and nourishes your skin, but also provides superior anti-aging benefits by tackling wrinkles and fine lines head on. 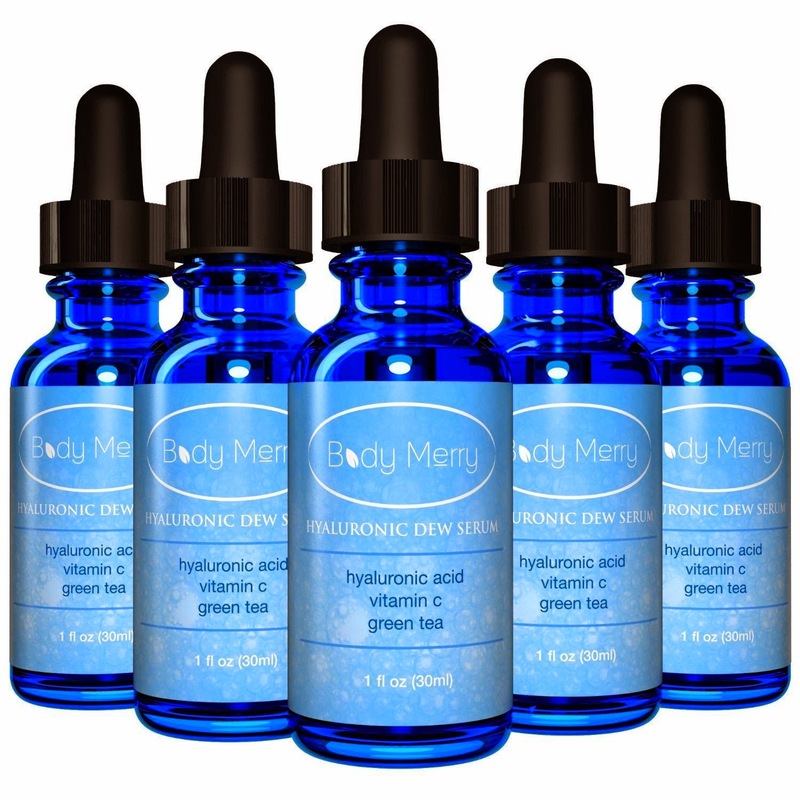 Body Merry's Hyaluronic Dew Serum is the perfect anti-aging moisture rich product - formulated for all skin types, free of any potential irritants. NATURAL & ORGANIC: Plant derived Hyaluronic Acid is cushioned and supported by powerful antioxidants such as Vitamin C, Green Tea and Organic Jojoba Oil, to give your skin a youthful, bright and even complexion. Free from harsh chemicals such as Parabens, Sulfates and Phthalates. No fragrances or alcohol. MADE IN USA + CRUELTY FREE: The serum is made in the USA in an FDA registered and GMP compliant facility. It is not tested on animals. MANUFACTURER GUARANTEE: Body Merry's products are backed with a 90 Day 100% Satisfaction Guarantee. If you don't like this serum, just contact us and get a full refund. You don't even need to return the bottle. Clean and dry your skin. When using a toner, apply the toner prior to the serum. Use your fingertips to apply a small amount of the serum on your face and neck. Once it is completely absorbed, follow with a moisturizer. Can be used daily and under make up. Find out what an invisible veil of moisture feels like! As we age and expose ourselves to environmental damage, our skin is depleted of its natural moisture. Body Merry's Hyaluronic Dew Serum is an intensive hydrating formula that seeps deep into your skin and nurtures it from the core. MANUFACTURER GUARANTEE: Body Merry offers a 90 Day 100% Satisfaction Guarantee on all its products. Hassle free money back, with no need to return the bottle! 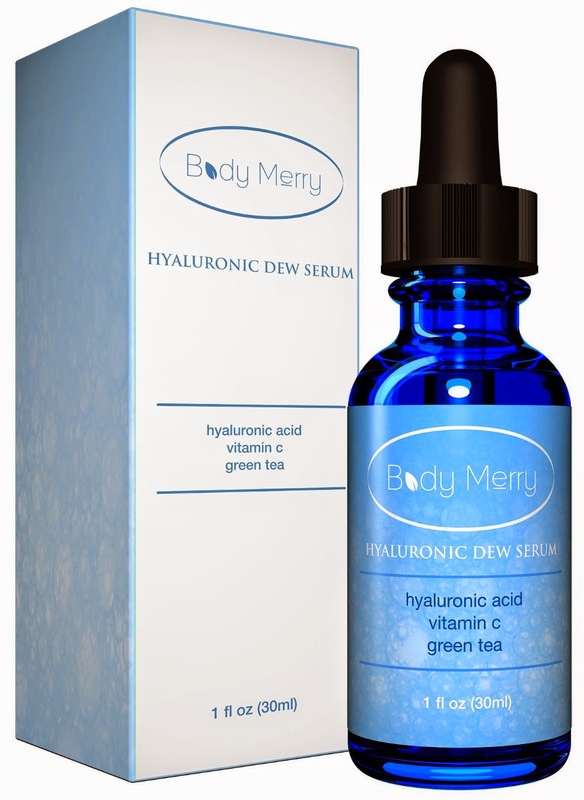 I was happy to get to try Body Merry-Hyaluronic Acid Serum. It comes in a glass bottle with a dropper applicator which I like because you use very little this way and don't waste any serum. I place a few drops on my fingertips and concentrate application to my eye area, then the rest of my face and neck. 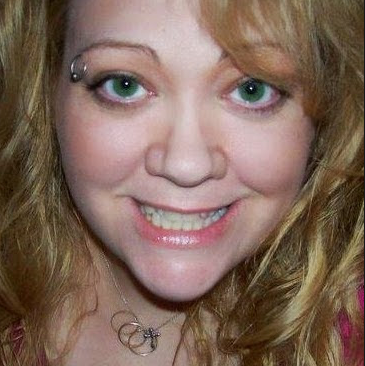 I continue with a moisturizer and I really like the results. There is noticeable difference in the fine lines around my eye area, my skin feels smooth and moisturized without feeling greasy or sticky. I like how the serum just plumps up the skin to smooth away those little lines. My skin feels nice and the tone looks brighter. I recommend this serum. This serum manufactured in north america within the FDA documented in addition to GMP compliant capability. It's not necessarily tried with dogs.